Company: Mitsui O.S.K. Lines, Ltd.
Liquefied natural gas (LNG) is drawing attention as a clean-burning fuel, and demand for it is growing all over the world. Mitsui O.S.K. 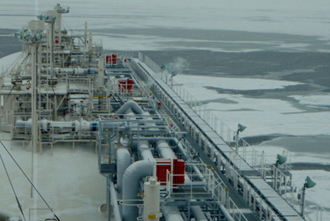 Lines, Ltd. (MOL) is a world class LNG carrier company. MOL first participated in an LNG transport project in 1983. Today, MOL is involved in about 20% of the world's LNG transport in terms of ownership, management, and operation of LNG carriers. As the leader in LNG transport, MOL continues to meet the world's growing LNG demand with an expanding fleet and a vigilant focus on safety. MOL formed a consortium with Kawasaki Kisen Kaisha, Ltd. ("K"Line) and Primorsk Shipping Corp. (PRISCO). MOL's consortium received a contract from Sakhalin Energy Investment Company Limited (SEIC) for a long term timecharter and built a new LNG carrier, S.S." Grand Mereya ", for the transportation of LNG from one of the world's biggest natural gas fields, Sakhalin 2. Grand Mereya was built in Chiba, Japan by Mitsui Engineering & Shipbuilding Co., Ltd. (MES) and is operated and managed by MOL. It has a length of 289.5 meters and a width of 49 meters. The LNG tank capacity is about 145,000 cubic meters, and it is one of the most advanced LNG carriers in the industry. Yokogawa successfully delivered a CENTUM CS 3000 Integrated Control Automation System (ICAS) for this project and supplied various kinds of field instruments such as transmitters and vortex flowmeters. Today Grand Mereya is stably operating and safely delivering LNG. Sakhalin 2 is an international project between Japan, Russia, and the UK for developing a gas & oil field and shipping the gas and oil overseas. Many multinational companies are involved in this project. Yokogawa set up an international project team with highly skilled engineers from Yokogawa Malaysia, the main job executor, and from Yokogawa Tokyo, the overall coordinator. With its rich experience in LNG cargo and marine application know-how, Yokogawa took complete responsibility for the ICAS project's management, engineering, commissioning, and services. A wide range of functions were integrated in the CS 3000, meeting the customer's various requirements and expectations. 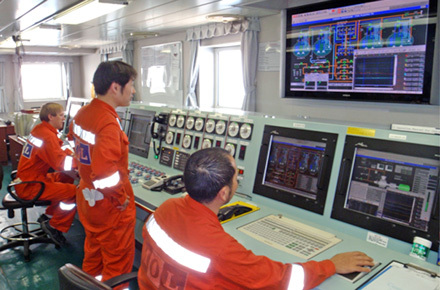 The project was successfully accomplished and Yokogawa's performance was appreciated by MOL. On an LNG carrier, cargo and machinery need to be controlled and monitored. This includes boiler and power management, LNG loading/unloading, and ballast control. A unified operation and monitoring environment simplifies decision making for complex LNG cargo and engine control operations. It also incorporates open interfaces so that supervisory computers can access trend data, messages, and process data. All process data can be monitored effectively at human machine interface (HMI) terminals and on a large screen. This makes it possible for operations on the LNG carrier to proceed more quickly and safely. Due to the high reliability of the ICAS operation on Grand Mereya, MOL can schedule the transfer of LNG to each destination without any problem. Needless to say, CENTUM CS 3000 has received various hardware type approvals from classification societies such as Lloyds, ABS, and BV. Today, there is also a need in the market for assessment of software quality and quality control systems. CENTUM CS 3000 has acquired the Software Conformity Assessment Certificate from Lloyd's Register Asia. Grand Mereya CENTUM CS 3000 project was the first project to apply for this assessment in Japan and Yokogawa executed it fully in keeping with the certified procedure for software quality control. One of the MOL engineers said, "Our mission is to deliver the LNG safely and reliably on time. The Yokogawa CENTUM CS 3000 is so far so good to meet our requirements in terms of stability and operability. At the same time, the service network is also an important factor in our operation. Yokogawa is a globalized company with a worldwide service network and we will be able to rely on their service capability if any problem occurs. We would like to work with a system supplier who is looking to improve the safety, efficiency, and reliability of their operation while keeping quality high. We feel Yokogawa is one such company that is qualified to work together with us." 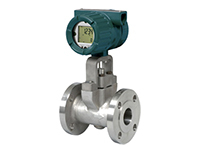 Yokogawa's standard Vortex Flow Meter.